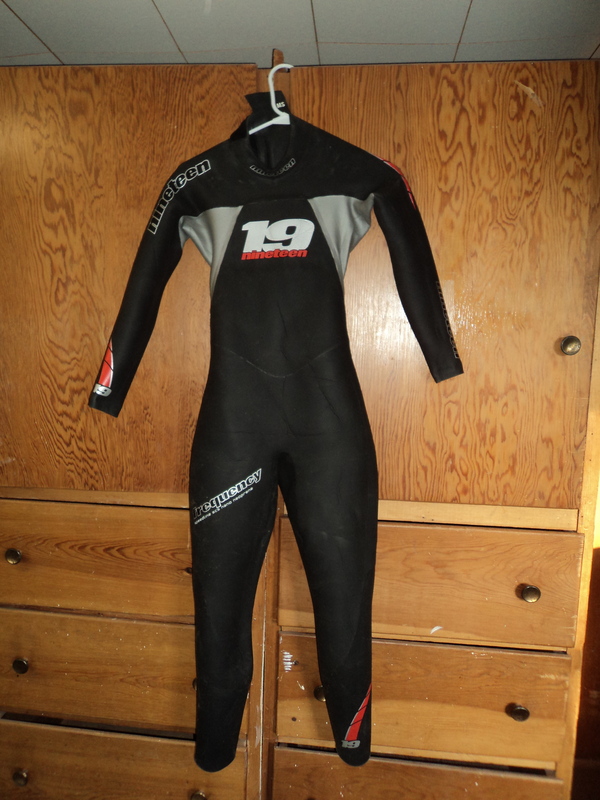 Since I currently am sans wet suit, the good folks at Trisports.com let me borrow two for my race last weekend. I choose the Nineteen Frequency to do the race in leaving the other suit at home. 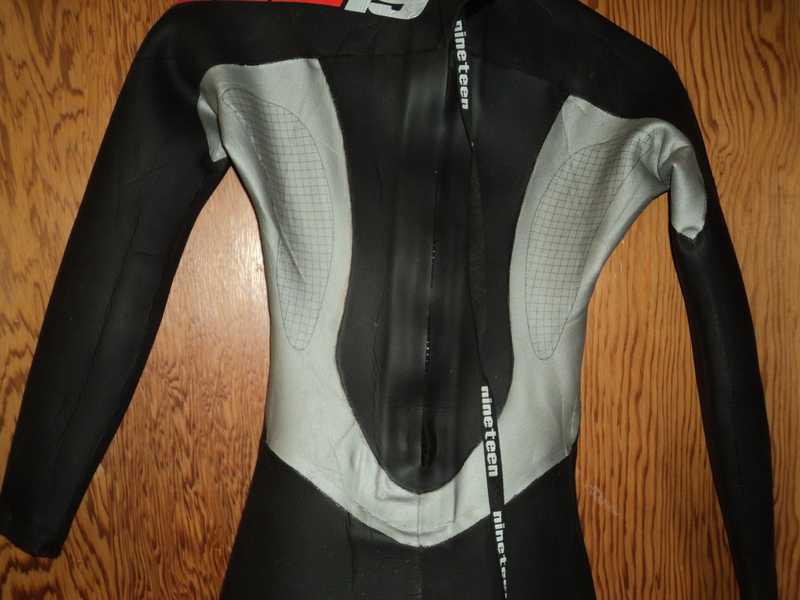 The Frequency is Nineteen’s top of the line wet suit. The main chest panel and legs are 5mm to float you high and make you fast. The arms, lats and lower back have a very flexible 1.5mm #40 rubber panelling. 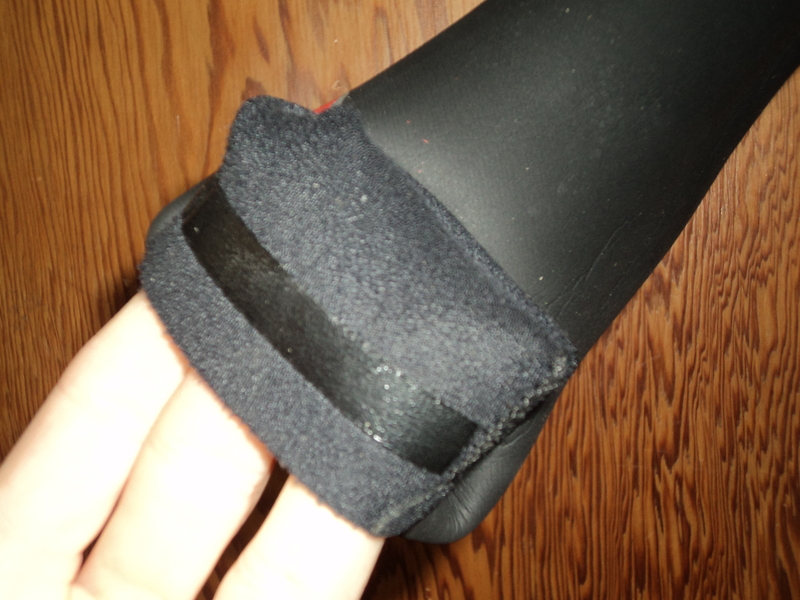 This enables the arms to have a full range of motion. I did not notice any restriction when swimming. The 1.5mm arms also make the suit very easy to peel off the top of your body. There are several features and a lack of a feature which make this suit an awesome suit. Lets get to the lack of feature because it’s this lack of feature that helps a suit swim faster. There are no water gripping panels in the forearms. It seems every top of the line suit has some sort of panels. While I’ve not seen the data for the latest round of suits (2010 and on), I have seen data showing that these gripper panels at best have no propulsive function and in many suits actually cause the suit to be slower then the same suit without gripper panels. Unfortunately most companies view gripper panels as a must have to satisfy the I need another gimmick crowd. The features that make this suit a good suit include the 2mm panel on the back of the calf and the legs that facilitate easy removal of the suit in transition. The suit is also cut higher in the back of the legs to help slip over your heels. Nineteen calls it EasyOff Legs and the suit does come off easily. The other feature that in my opinion Nineteen does better then many of the brands is what they call Kungfu grip arms. It’s a small piece of silicone around the inside of the wrists. This helps keep the suit locked to your wrist and helps prevent water from flowing up into the arms upon entry and catch. During my race I never noticed any water flowing up into the suit. Unlike some other suits I’ve swam in, this suit is easy to remove over the wrists and hands. My previous wet suit always engaged you in a wrestling match to get out of it. The KungFu gripper tape works better since you are not wasting your time or energy wrestling with it in T1. There were two small things I did not like about his suit. The first was upon jumping into the water I noticed water immediately entering trough the zipper area. 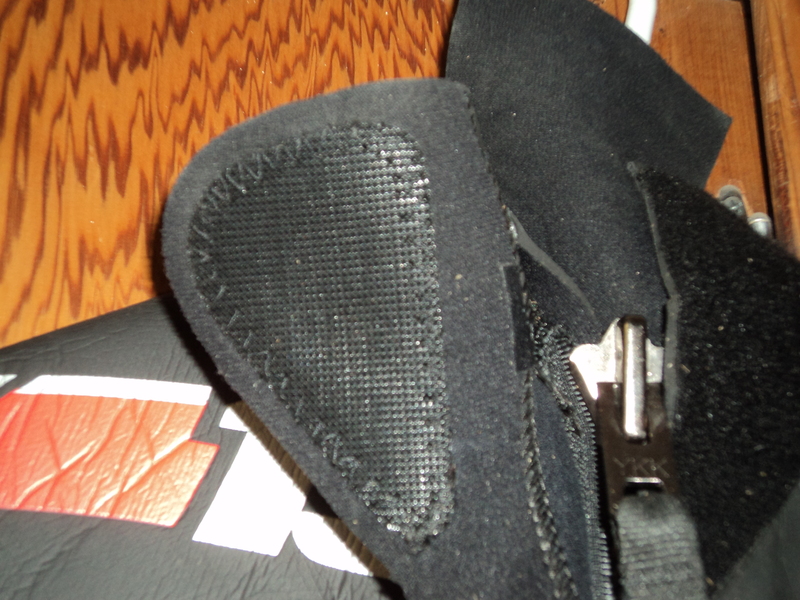 The second was the velcro closure. The side that closes over the collar sealing it shut has been reinforced. While that reinforcement makes it easy to grab and open upon exiting the water, it took several tries to position it so that it did not scratch my neck. The neck collar itself is very comfortable and well designed. I never thought about it, did not get a wet suit hickey even without body glide and never had any water leak in while swimming. All of which are very, very good things. This is a very well thought out and designed suit that fits true to the size chart. It’s non gimmicky, it’s designed to keep water out, float you high, help you swim fast and make T1 as easy as possible. If you are looking to get out in front of the crowd and swim fast, this could be your suit. You can read more about it here.